Summertime is great time to do some reading that usually gets set aside during the frantic school year. This summer I have been reading a few books and I'll share some short thoughts. This is my favorite book in my summer reading group. It shows all the behind the scenes, creative, and innovative work the Disney Imagineers have made around the world. There are stories, wonderful images, and information about creating the Disney parks around the world as well as the cruise line. It's such an inspiring book for me because I would love to become an Imagineer someday (although I'm open to many other possibilites as well). This book was part of my 3D Kinetic Anatomy class I took this summer and helped me make my écorché. It has great pictures of bones, muscles, tendons and more. This book has given me a greater understanding of human anatomy and I will definitely reference it in the future when I am drawing figures. I love everything about Pixar so I decided to check out this book. I really enjoy it because I can see and learn about the processes that went into making the movie. Such decisions that were made in character design were really insightful (such as how Remy's nose points down so he can smell the food better and is more friendly looking). The research that went into the movie was also really inspiring. The crew got to visit Paris and see the sewers as well as go into kitchens of the finest restaurants. 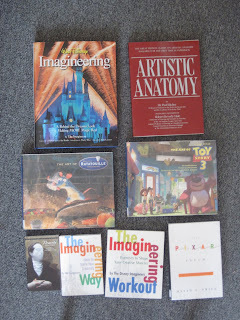 Again another Pixar "Art of" book. This book has a few pages of art from the previous Toy Story movies so that the rest of the book within the right context. My favorite parts of this book are the color studies by Dice Tsutsumi and Robert Kondo as well as the color keys. There are also a few places in the book where they show a setting and arrows with the order of events that happen during the scene, such as the canyon opening scene in Toy Story 3. I haven't started this book yet, but am very excited to at least start it before summer ends. I have heard a few great reviews from people lately that it's a great book. This book was never part of my reading curriculum and thought it would be great to catch up on a classic because as an illustrator it is always important to know about stories. This book is filled with short 1-4 page stories and insights about the Imagineers creative process. While it doesn't talk too much about specific attractions it does say important things to say about the creative process. Some of these things I had already learned, but didn't know how to put them into words, others I had never thought about. One of the many things I took away from this book is to never make anything just "good enough" because everything should be great. This book is also written towards the non-creative non-artistic person and is very welcoming. I haven't started this book yet either but it is the sequel to the Imagineering Way. This book is interactive and has exercises to get the reader to think creatively. It covers how to create and execute ideas as well as making concepts better. I'm excited to use this book and see where my creativity takes me. I'm almost halfway though this book and am enjoying it very much. I already knew a basic history of Pixar though various readings and videos, but this book gives much more depth and insight into how this company became what it is today. For example, I never knew that basically all the geniuses who invented computer graphics were interested in being animators at one point in their lives and saw the potential computers had for creating animation in the future. It's inspiring to hear about how people were so inventive and adamant about trying a new medium while they were struggling to get funded for their projects. That's all for my reading reviews for now. I should also mention that my RA T-shirt design won the competition! I'll share photos of the shirts once they are made.